In my senior year at UC Berkeley, I took a graduate class in Critical Making, where I met fellow students Tomás Vega and Oscar Segovia. Tomás shared with me his passion for creating technology for people with disabilities. Tomás and some of his friends including Pierre Karashchuk and Kelly Peng were working on a project to be submitted to Berkeley Big Ideas Competition. 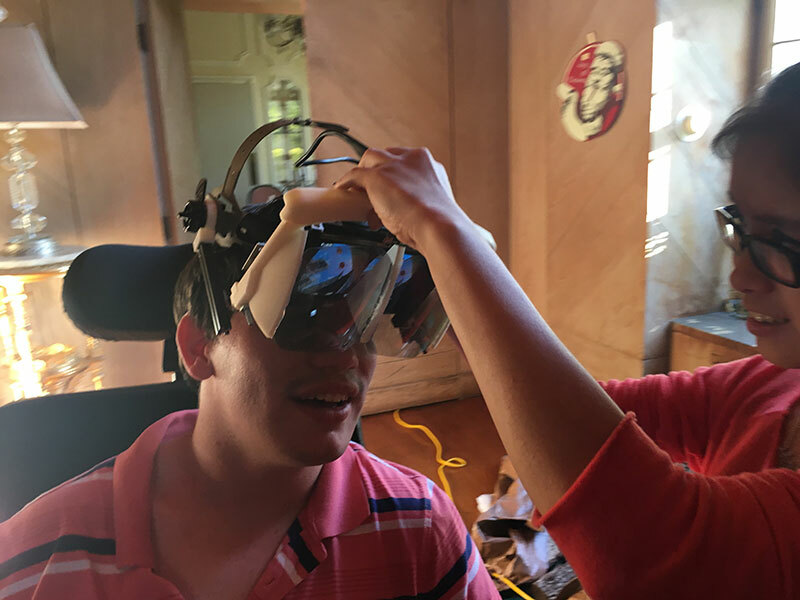 Excitedly, I shared my brother's passion for technology and his belief that through technology anything could be accomplished; Daniel has cerebral palsy and a cortical vision impairment. The team started to work with Daniel, to design a mind-controlled machine, i.e. a thought controlled wheelchair. Collaborating with Daniel, they found many things that worked but also assumptions that did not. It was a formative and empowering experience for everyone involved. The team ultimately placed first in the Berkeley Big Ideas Competition but that is not where the story ends, but rather where it begins. Tomás, Pierre, and Kelly continued to come over to Daniel's home through the coming year. 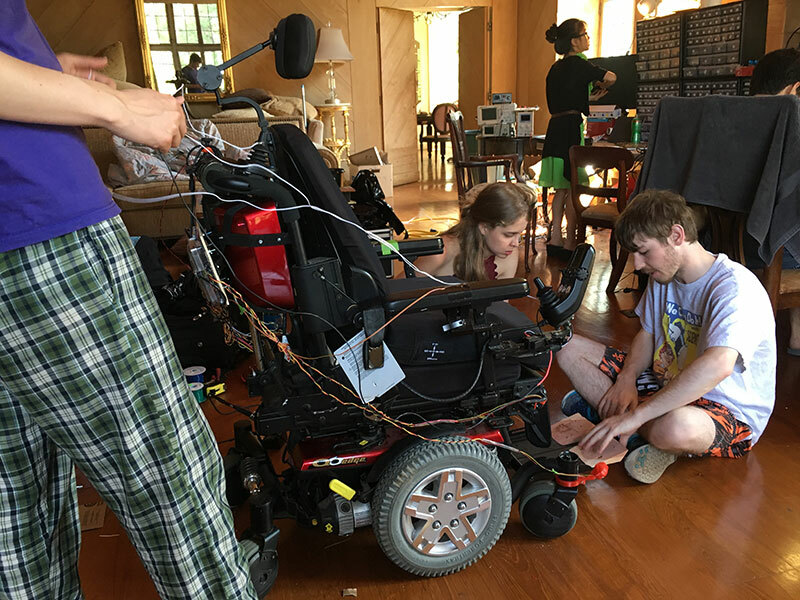 They wanted to create technologies that would improve and empower his independence. One such idea was augmented reality. Augmented reality allows the user to interact with the world by recognizing and augmenting visual surroundings. Taking a lampshade for example and turning it green, or in Daniel's case making stairs or ledges bright color such as red, enabling him to identify changes in elevation or potential hazards. This process of love and creativity while visiting Daniel continued until Pierre came up with an interesting idea in which he proposed that a group of friends observe and live with Daniel for a period of a week. This laid the foundation for our weeklong Makeathon from August 14-21, 2016. A Makeathon is where a group of individuals come together to collaborate and solve a specific challenge. At first it was Tomás, Pierre, and Kelly, but then it started to expand. Tomás is a cofounder of Assistive Labs, which builds assistive technology for special needs in developing nations. Another cofounder Stephanie Valencia heard about the Makeathon and was very excited in participating. Stephanie is a fellow at the Technology and Innovation Lab at Yale University Child Study Center. 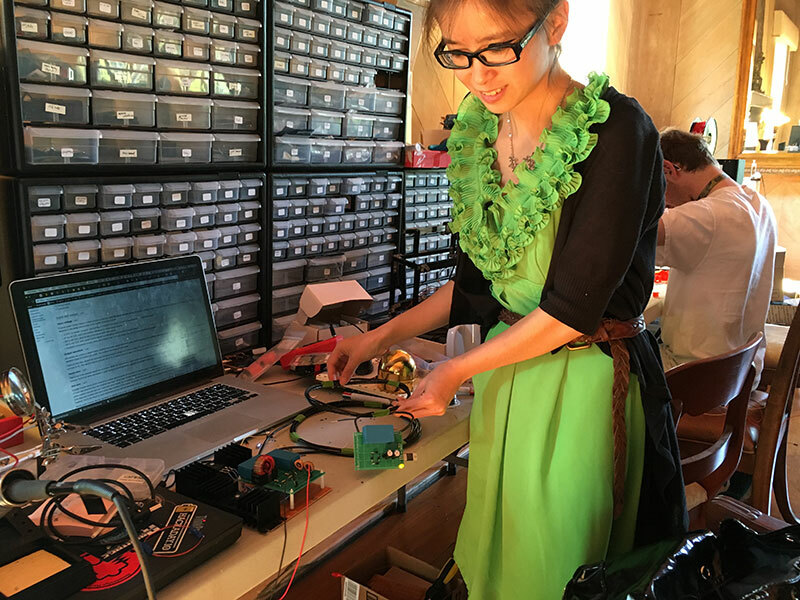 She booked a ticket and flew across the country to participate in the Makeathon. Kelly invited Ryan Sternlicht and Tomás invited Oscar Segovia, masters in mechanical engineering, and later Corten Singer. What started as an idea by one had manifested into a team of seven. For over one week our living room was transformed into a Laboratory. With soldering devices, multiple 3D printers, each engineer bringing their own equipment and technology. The first few days engineers observed Daniel, doing everything with him from tucking him into bed, going to the store and eating dinner, which we did as family every night. Brainstorming sessions led to hypothesis and a gathering of facts for what Daniel could do and what could be created to assist him. Daniel does not have the fine motor skills, at this juncture, to manually plug his electric charger in the wheelchair. We looked at inductive charging, where Daniel would wheel his electric chair over a device and it would begin charging without needing to be plugged in. We tested Kelly's augmented reality device. What had been a concept over a year ago had turned into a tangible device, in which Kelly had iterated with Daniel every step of the way. Kelly's augmented reality display company is now called Aurora AR. Another pressing challenge and area to explore was Daniel's electric wheelchair and the obstacles of navigating with low vision. With Daniel's cerebral palsy and cortical vision impairment, his sight is limited. He can see out of a sliver in his right eye but the vision is sporadic. It is akin to turning a light switch on and off. Low vision can prove very challenging when navigating surroundings with a wheelchair. Hence, a direction was formed on how best to remedy this. The rest of the week was dedicated to creating an edge detection wheelchair. Sensors were placed underneath Daniel's wheelchair foot, on the sides, and back of his chair. We used tape and pieces of paper as sensors, for the first iteration. The theory was, using infrared technology, the sensors could measure the distance between Daniel's chair and the ground. If that distance ever increased, Danny would know a ledge or stairs were near. Conversely, any change to the sensor meant an obstacle or curb was near. Upon getting too close to a ledge or stairs, the sensors initiate a beeping sound providing Daniel, in audio format, a way to be aware of his surroundings. Hence, the engineers at the weeklong Makeathon designed a new type of edge detection system that notifies Danny when he drives near stairs or other ledges. We also noticed Daniel had challenges using the ramp. We came up with an alternative way of interacting with his surroundings through touch. We set up lateral edge detectors to assist Danny in navigating up and down ramps. If Danny gets too close to the left edge of the ramp, his left armrest will start vibrating, alerting him to self-correct through haptic feedback. Thus, if one goes straight up the ramp and nothing vibrates it is an indication that person is navigating safely. But if the right armrest vibrates that is an indication, the person's chair is too far to the right and is about to go off the ramp. We created through audio and haptic format a way for the wheelchair to have safety mechanisms. These safety mechanisms translate to increased freedom, independence and user peace of mind. Our Makeathon team is excited to share our success story at Abilities Expo Bay Area, November 18-20. The process of coming together to solve real world challenges in a short period of time was thrilling, rewarding and, ultimately, very effective for Daniel, the inspiration and hero for our story. We believe this process could be helpful to others in the community of people with disabilities. Perhaps there is a Makethon in your future? 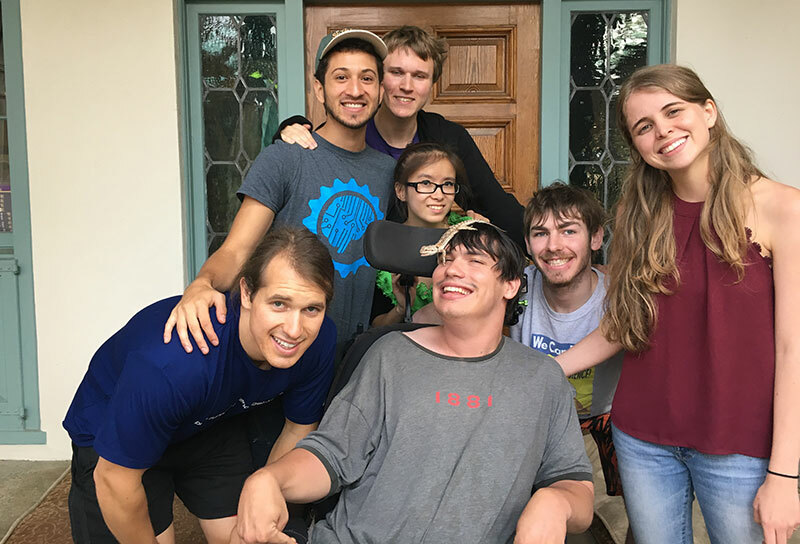 Stanford Stickney is a devoted brother to Daniel, a young man with Cerebral Palsy and a cortical vision impairment. 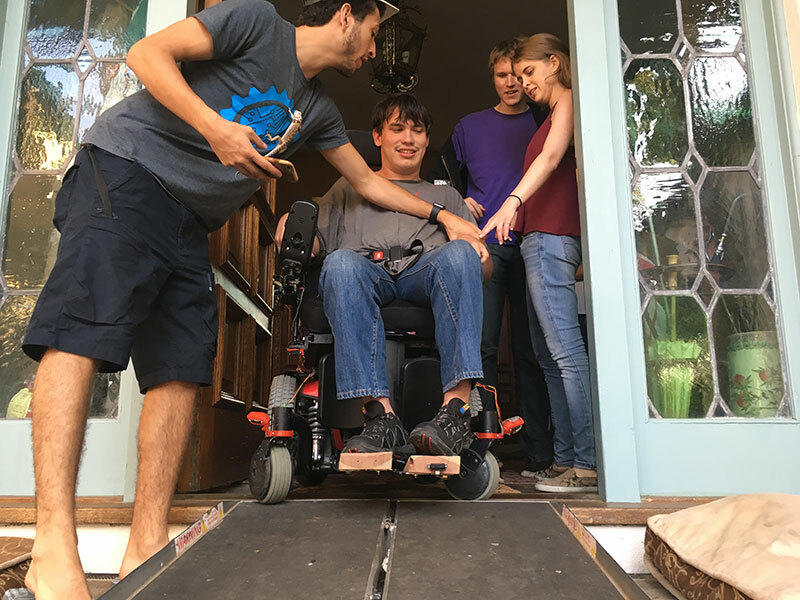 To increase his brother's independence, he brought together a team of brilliant minds to work together and solve Danny's wheel navigation challenges in a weeklong Makethon.